A Storm of Swords: Who is the deadliest warrior in all of Game of Thrones? (Part 1) – AiPT! The mature question on everyone’s mind: Who would win in a fight? With the finale of Game of Thrones nearly here, we’re all taking a longing look back at Westeros and thinking of all the fond memories. Tyrion and Bronn’s budding bromance, the sweetness of Arya’s relationship with Hot Pie, the…horrific violence that befalls seemingly every character we grow to love. The world of Westeros is indeed a violent and scary one — and you’ll need to be quick with your wits and handy with a sword if you want to make it through. So the natural question then becomes: Who is the baddest man, woman or child swinging steel in all of Game of Thrones? I don’t know if you noticed, but we here at AiPT! are huge nerds, so we took the most (mildly) scientific method to rank (subjectively) the greatest warriors on Game of Thrones, and for the next several weeks, we’ll be counting them down from worst to best. The rubrik by which we’ve named our champions is simple: We’re only going by what we’ve seen in the show. Deeds and characterizations from the book will not be considered. We should also note that though not every entry will meet this criteria, there’s a loose “one kill on screen” rule in effect, hence why fan favorites like Rorge, Biter and Hot Pie don’t make the list. Similarly, this is a humans-only list, so Wun Wun, the Night King and those darn dragons won’t be counted. I feel like Drogon may have a bit of an advantage over the people on this list. With that all out of the way, it’s time to decide Who is the baddest man, woman or child in all of Westeros? We have to start somewhere, and it doesn’t get much lower than Ser Dontos Hollard, the drunk oaf who attempted to participate in a melee on King Joffrey’s name day only to be embarrassed and almost drowned but for the kindness of Sansa. To what degree he was ever a knight is unclear because…well, look at the guy. The dude doesn’t really show much in the way of battle prowess, and honestly, though he was the first guy I thought of to sit at the bottom of this list…dude never successfully killed anyone, making him ineligible. If anything, that arrow that Littlefinger planted in his chest was a mercy — he wouldn’t want any part of the oncoming conflict with the wights. Despite being one of only two people on this list to have successfully killed a White Walker, I don’t think even Sam would be surprised to be this low on the list. Sam’s a bookworm, not a warrior — a fact that has actually helped him outlive most of this list. Yeah, he’s a near total wuss, but his intellect, loyalty and heart have made him an indispensable part of the Westerosi resistance – and would likely allow him to work around the stumbling mess that is Ser Dontos. There’s a popular fan theory that says the entire Song of Ice and Fire/Game of Thrones series is being narrated by Sammy boy, and since I fully expect him to live through the whole thing, that may end up being the case. That smirk is only because he’s not last on this list. More a singer than a fighter, good ole Pyp was little more than a redshirt in the world of Westeros. Forced to take the black after he refused the advances of a nobleman, Pyp existed solely to die and serve as added pathos for more important characters (namely Jon and Sam). Though he never showed much in the way of strength, bravery or even luck, I still think he’d take Sam in a fight. That and his sobriety alone place him this high on the list. Seen here looking like a mannequin. The bratty boy king was definitely a cruel murderer, but not a real fighter. Joff only got to live out his darker passions due to his status and the privelege it confers, as he would be CRUSHED in any straight fight with anyone who isn’t actually impressed by his last name. Joffrey never would have made it far in the show, as someone was always going to get have him killed, so it’s unlikely he ever would have seen the Walkers’ march on Kings Landing. As far as obnoxious, murderous teenagers go, at least Olly is a step up. The kid may have next to no training, little in the way of strength and no battle skills to speak of, but you think he wouldn’t smoke the dorks we’ve already mentioned thus far? Sam and Pyp are total hapless weenies, and Joffrey is a total b*tch, so there’s little doubt that Olly would wreck that pampered prince’s shop. The kid has two high profile kills, though both come with an asterisk, which is why he can’t go any higher on this list. From a literal child to a man that has literally killed children. The disgraced leader of the Gold Cloaks-turned brother of the Night’s Watch makes it this high on this ranking because he’s the only person on this list who has successfully swung a sword before. Now admittedly he’s a cowardly old man at this point, and he’d likely only beat Olly by outwitting the young boy, but if he was willing to stab a baby, he should make quick work of a gangly teenager. Dude’s a snake who would be wight food if he hadn’t already been beheaded for his attempts at treason. Shoot, he would likely be better off as an other, frankly. To be fair, he’s got a lot of experience in trial by combat. Speaking of someone who survives on wits alone, my man Tyrion is one of, if not THE best character in all of Game of Thrones. The Lannister Imp does a lot more than just drink and know things — he’s endeared himself to the readership like few others and emerged as one of the most important people in the shaping of Westeros’ future…he’s just not going to do it with a sword in his hand. He is considered on this list for an impressive display of battle prowess both on the road to the Aerie and in the battle of the Blackwater (making an even better showing of it in the book series), but even Tyrion would admit that he’s no fighter. He’s good enough to best shlubs, geeks and children, but the halfman would get stomped by anyone who actually knows what they’re doing on the battlefield. I would love to see him live long enough to see the new country he’s helping to create, but given that George RR Martin has promised a “bittersweet” finale, there are few deaths that would mar an otherwise happy ending quite like the loss of everyone’s favorite Lannister. Pod’s made of sterner stuff. Tyrion was lucky to get out of the Battle of the Blackwater alive, and his boy Pod is the guy who got him through it. Our sweet Pod makes the list for what is at best a surprising proficiency at killing that has allowed our favorite squire to live through several conflicts that felled far greater warriors in the process. Now sure, he’s killed a bunch of people in the service of Tyrion and Brienne, but Pod’s no warrior. The Seven have granted him several other “gifts”, but battle prowess is not one of them. As such, though I’m sure he’s strong enough to get past the physical inadequacies of Tyrion and the jabronis below him, he’s not about to take on the Clegane brothers. If Pod’s got any chance of seeing the end of the series, he’d be best suited sticking to the sidelines. Like Edmure, Lancel’s a castillan-trained lordling who has the advantage of coming from a rich family, but no real talent for battle. His late-stage heel turn as a member of the Sparrows movement removed a bit of his overtly weak resolve, but it didn’t do much to improve his skills with a sword. Against the untrained and unskilled he may be OK, but give him a more experienced warrior and Lancel’s toast — even with the seven on his side. He’s sort of a medieval Bryan Cox. The late Lord Commander of the Night’s Watch was a fairly accomplished warrior and nobleman in his day, but age has definitely slowed the great bear. 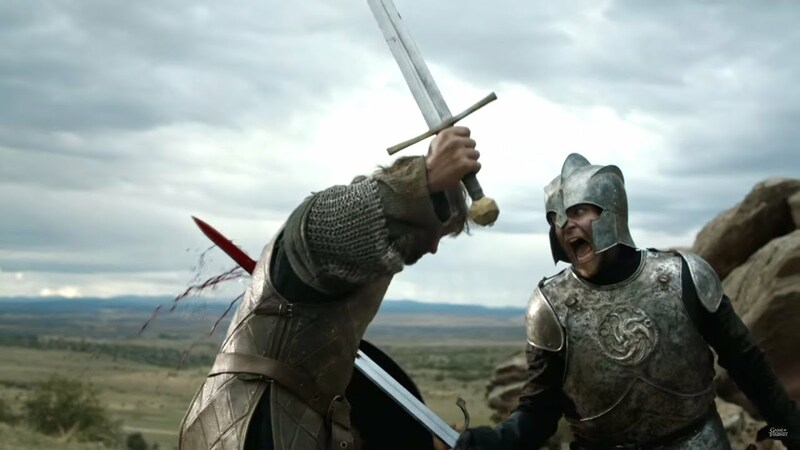 Though he’s proved himself capable against wildlings and a handful of deserters (and would have little issue besting pampered poodles like Edmure or Lancel), the fact that some barely trained scrubs like Rast and Tanner were able to take him down suggests that his days as a threat on the battlefield may have been behind him. Given his pride as a man of the Watch, there was never a chance he was going to make it out of the conflict with the wights alive – though he probably deserved better than having his skull used as a cup for Kraster’s wine. She’s Tonks-a tough!…I’ll see myself out. Osha is a bit of an anomaly when it comes to the wildlings, as she has a more natural talent for violence than those below her on this list, but not the experience of bloodlust of those above her. Her combat style is more about misdirection and stealth, which works to a point, but can’t put her over some of the more cunning or clever warriors on this list, either. Her greatest success in a fight is more based on her opponents’ underestimation of the threat she poses than her abilities with a spear, which is why she may be able to get past the old and the dim, but the younger and rougher crowd will likely take her down. The new and improved Osha 2.0. The older of the Reed children and seemingly the only one in Bran’s retinue who made it out of the voyage to the north alive, Meera is a cunning and clever warrior. Like all Cranogmen (Cranog-people?) She uses her wits and wiles, rather than any strength or skill advantage — which is good, considering most everyone in Westeros looking to do her harm is bigger, stronger and meaner. Still, she could pull one over on the weak and stupid, but no one’s confusing Meera with a warrior. She’s a low level ranger at best, and has a better chance of surviving a fight than most, just not by defeating her opponents. Rast doesn’t have a ton of personality, but he’s so damn handsome. A barely trained lout, Rast is among the worst that the Night’s Watch produced during John’s time with the brotherhood, but that shouldn’t suggest he’s not a violent SOB to be feared. Most of Rast’s battle experience doesn’t showcase a skilled or particularly brave fighter, but his role in the mutiny at Craster’s Keep does prove he has a certain tenacious nastiness that will help him in a fight. That being said, he’s not a soldier, he’s not a fighter, he’s a thug — and though there are some thugs pretty high on this list, they certainly have more of a knack for battle than sad ol’ Rast here. And that’s all for this week. Be sure to check back next Friday for the next installment featuring the (mildly) more effective warriors of Westeros.